Tic-Tac-Toe - Red Box - Suggested Retail $5.50 ! 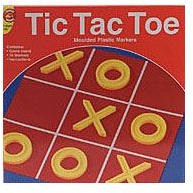 Red Box Tic Tac Toe includes 10 sturdy plastic playing pieces, board and instructions. For 2 players. Ages 6 and up. Size (inches): 1.57" X 9.84" X 9.84"
More Photographs - Tic-Tac-Toe - Red Box - Suggested Retail $5.50 ! End of More Photographs - Tic-Tac-Toe - Red Box - Suggested Retail $5.50 !